EMSB BUDGET: On June 28 the EMSB Council of Commissioners adopted a balanced budget for the 2017-18 school year. The Council is pleased to highlight that, according to the Budgetary Rules, the EMSB has included in next year’s budget, the equivalent of 15 percent of the adjusted June 30, 2016 accumulated surplus. This will allow the board to benefit from an amount of approximately five ($5) million dollars in additional operating monies to support the educational projects in all EMSB schools and centres next year. Over one-third of this surplus amount ($1.7 million) will be allocated directly to schools and centres to support local projects and initiatives. Another $600,000 will be allocated via the service departments of the board for various educational initiatives in partnership with the schools and centres. The Board will be determining the most appropriate and effective use of the non-allocated amount of $2 million at the beginning of the 2017-18 academic year to further support schools and centres in their educational missions. LIBRARIAN RETIRES: Deborah Novack may be accustomed to turning pages in treasured texts, but the precious chapter she concluded June 2017 covers 29 significant years as a librarian at Laurier Macdonald High School in St. Leonard. As a working mother of two daughters, one in medical school and the other a recent graduate of UBC, she empathizes with mothers juggling households and careers. Ms. Novack credits her mother, a school librarian for telling her to take typing lessons in the 1970s in order to assume a summer job preparing the library for the fall term. Those were the days before personal computers, the Internet, social media and smart phones; therefore, touch typing proficiency was essential. When it came time for university, Novack applied for law and library science at McGill. She opted for library school because they accepted her first. “After a year of library studies, I was hooked,” recalls Novack. She attained a Master’s degree in Library Science from McGill University in 1981 and subsequently served as librarian in various elementary and high schools under La Commission Scolaire Jêrome Le-Royer (now part of the English Montreal School Board). YA WRITERS CONTEST: The winners of YA Media’s YA Writers Contest were announced at a red carpet event on Sunday, June 25 at the Leonardo Da Vinci Center in St. Leonard. Students from the EMSB and the Lester B. Pearson School Board attended to celebrate their story-writing talents. YA Magazine’s YA Writers Contest invited students from Grades 1 to 11 sfrom the EMSB and LBPSB to submit handwritten, original, illustrated stories that were no longer than 12 pages, to Giancarlo Mirabelli, YA Magazine editor and teacher, and Carolyn Flower, published author and head of carolynflower.com Entrerprises Global. Of the 1,000 entries submitted, 40 students from three grade categories at each school board were selected as finalists. These students were invited to attend the gala, walk the glamorous red carpet, and enjoy the award ceremony hosted by local comedian Guido Grasso. Winners from John Paul I Junior High School showcase their certificates. Winners from the EMSB were: Sara Lijoi, Grade 4 (Dante School); Thomas Proctor, Grade 4 (Gardenview); Neve Leblanc, Grade 3 (Royal Vale); Sydney Schnurbach, Grade 4 (Merton); Jaime Kunin, Grade 4 (Merton); Clara Dilazzaro, Grade 6 (Leonardo Da Vinci); Gianna D'Amico, Grade 5; Liem Yiep, Grade 5 (Willingdon); Sandro Lijoi, Grade 6 (Dante); Alyssa Guaragna, Grade 6 (East Hill); Jenny Gagne, (JFK); Cecile Castro, Grade 10 (John F. Kennedy); Erica Nudo, Grade 8 (John Paul I); Alexander Meleras, Grade 9 (Royal West Academy); Cosimo Nicita, Grade 7 (John Paul I). Stories were judged by Concordia students, journalism professionals and literary experts. The winningstories will be compiled in an e-book titled Ya! Storybook, which will be available worldwide on Amazon in November. Congratulations to these soon-to-be-published authors. See our photo album from the ceremony. 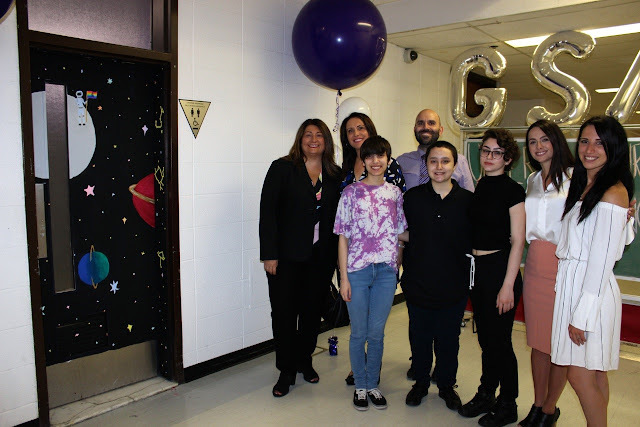 UNIVERSAL WASHROOM: An official ribbon cutting ceremony took place at Lester B. Pearson High School (LBPHS) of the EMSB in Montreal North on June 19 for the inauguration of its universal washroom. Celebrating the launch of the Universal Washroom. Lester B. Pearson High School’s Gay Straight Alliance (GSA) student members worked in collaboration with Principal Joseph Vitantonio and Guidance Counsellor Natasha Krsteski to provide students with a washroom that is accessible to all.This unique new washroom is gender neutral and universally accessible. It includes two stalls, one of which is wheelchair accessible. It was important for the students to make this washroom as comfortable as possible. “School is our second home. Everyone should feel safe,” shared LBPHS student and GSA member Sonia. This thoughtfully planned washroom is also a place to learn and share. On the sink counter rests a rack of pamphlets that inform on relevant topics, from sexual orientation to contraception. A poster in one of the stalls sends a message about changing the way people are treated online, and encourages students to post positive messages. The entrance door to the universal washroom is beautifully painted with stars and planets, thanks to art teacher Ms. Koranteng. A plaque hangs beside the door indicating the washroom is accessible to men, women, and has wheelchair access. This information is provided in Braille on the plaque. EMSB Regional Director Evelyn Alfonsi was thanked by Principal Vitantonio for providing the funding for the universal washroom. EMSB Vice- Chair and Commissioner Sylvia Lo Bianco and Spiritual, Religious and Moral Education Consultant Frank Lofeodo were present for the ribbon cutting ceremony. Guests all enjoyed a reception to celebrate this important accomplishment. Showcasing their new community garden. WILLINGDON'S 375 PROJECT: To mark Montreal’s 375th anniversary, Grade 6 students at Willingdon Elementary School in N.D.G., along with science specialist Dr. Kathleen Usher and Urban Planning student Myriam Fakhri, embarked on a project that spoke to the needs of the school and surrounding community. Called Design 375 and funded by Youth Fusion, students chose to install benches, bike racks, plant a community garden and trees as well as paint two murals with welcoming messages of peace and hope. Neighbours can now use the lovely benches to read or picnic under the shady canopy of the apple and birch trees. Students can arrive at school and enjoy the colourful mural as they stow their bicycle for the day, teachers can use the site as part of an outdoor classroom to read, draw, garden and enjoy, and parents can chat on the benches as they wait for their children at dismissal. Next year, the project will be expanded with the planting of native fruit bearing trees to help urban wildlife as well as the school’s colony of honey bees. Principal Carmen Nicolas wishes to thank Vice Principal Vito Guererro and the Grade 6 teachers for their help ensuring the project was completed by the end of the school year. Pierre Elliott Trudeau staff and students with Johnny the Robot. ROBOCUP LAUNCH: The City of Montreal will host the 22nd Robocup International Competition and Symposium one year from now, June 15 to 22, 2018. EMSB Science and Technology Consultant Sara Iatauro is the local organizing committee chair.The RoboCup Federation, a distinguished non-profit research and development organization, annually hosts an international event with intelligent and autonomous cutting-edge robots developed by students world-wide. This federation is backed by industries, professionals and researchers from 35 countries who pioneer innovative new autonomous robotic and AI technologies. The Canadian RoboCup delegation is pleased to have been awarded their bid to host this prestigious event at the Palais des congrès de Montréal. This further supports Canada’s position as a leader in AI and reinforces the government mandate to advance scientific research and innovations. At the RoboCup International 2018 Montreal Canada Launch, several schools and universities will be showcasing their robot prototypes three of which will be competing in the RoboCup International 2017 event in Nagoya, Japan this summer. The EMSB qualifying schools in their RoboCup Leagues are: Merton Elementary, Rescue JUNIOR League; Pierre Elliott Trudeau Elementary, OnStage JUNIOR League; and Royal West Academy, Soccer JUNIOR League. Pierre Elliott Trudeau will be participating this summer in Nagoya, Japan. See this press release on the launch. O CANADA WINNER: Congratulations to John Caboto Academy in Ahuntsic, winners of the Breakfast TV Montreal O Canada contest. See this link. Having some fun in St. Laurent. TAKING THE PLUNGE: St. Laurent Adult Centre Principal Daniela Lattanzio took the plunge to implement the theatre program as an option course for Academic Students. The program director, Lina Maiorano, is relentless in preparing her students in a step by step program of study towards building a professional performance. Students attended class every day for three months and all took the responsibility of being each other’s understudy and carried their own main role with pride. The students performed four short plays written by Lina Maiorano and the themes covered were: Anti-Bullying; education is the road to success; not being in a relationship is okay; and correcting bad behavior. The audience was in awe and shared their positive feedback with the cast. Lina enjoyed sharing her knowledge of theatre with her students and is forever gratified to Ms. Lattanzio and the EMSB for allowing her to share her expertise. Two Laurier Macdonald Secondary V students won the Fonds 1804 Bursaries for school perseverance: Vanessa Marzano and Alissia Gomes, seen above with Vice-Principal Miranda Serrecchia. CONCERT TO BENEFIT CATS AT WAGAR:The Côte Saint-Luc Cats Committee (CSLCC) will hold its annual benefit concert on Tuesday, August 22 (7:30 p.m.) at the Syd Wise Auditorium (5785 Parkhaven) of the Wagar Adult Education Centre. Featured performers will be the Musicians of the World Symphony Orchestra (http://www.musiciansoftheworld.ca), conducted by Joseph Milo. Noted soprano Fairouz Oudjida will also present a solo performance The selection of music will be light classical pieces around the theme of Dance. Funds raised will go towards the CSLCC’s Trap, Neuter, Release and Adopt Program. The Musicians of the World Symphony Orchestra (MWSO) was founded in 2006 . This one of a kind orchestra is composed of 55 musicians: about 80 percent of its members are from 15 countries around the world, while the remaining 20 percent are natives of Montreal who successfully facilitated the integration of the newcomers. Tickets are only $12 each (tax included) and can be purchased now at the following locations: the main desk at the Eleanor London Côte Saint-Luc Public Library (5851 Cavendish Boulevard); the Côte Saint-Luc Aquatic and Community Centre (5794 Parkhaven Avenue); and the Côte Saint-Luc Hospital for Animals (7930 Baily Road). Tickets can be purchased at the first two locations by credit and debit card or cash and cash only at the Animal Hospital. You can also contact Mike Cohen at mcohen@emsb.qc.ca. This new EMSB budget looks really well worked out and has been planned really well. It has taken into consideration all the important aspects of the boards and their importance.